Travel 2015 | Who Can You Tell? We highly recommend that everyone attending the 2015 International Conference on Stigma take public transportation to The Blackburn Center at Howard University. How to get to Howard University VIA Metro: Take the Green Line Metro to Shaw/Howard University. Exit at the side toward Howard University. Once you reach ground level, there will be a bus stand to your left. Please wait for the Howard University Shuttle Bus which stops every 10 – 15 minutes. Board the bus by showing your state issued ID. Once you board the bus, please let the bus driver know that you will be getting off at the Cramton Auditorium. Once you exit the bus at Cramton Auditorium, please walk on campus for about 100 yards until you reach the Blackburn Center. You can always ask students or officers on campus for directions in case if you get lost. Alternatively, you can walk north up Georgia Avenue to campus. It will be about a 10-15 minute walk up to Blackburn. If you drive, the best parking option is the Howard Center lot which has recently been converted to a public lot. This is located at 2024 Georgia Ave, NW, however you must enter the lot from the back 8th st entrance (drive around behind the McDonalds). This lot costs a flat rate of $8, pay CASH ONLY on entry. From here you will have to cross Georgia Ave at walk up through campus to the Blackburn Center. In addition, there is on street metered parking which allows you to park up to 2 hours at a time only. Two hours means 2 hours. Once your 2 hours are up, you will need to move your car or you risk getting ticketed by the Washington DC transportation police. Please do not become a parking ticket victim! We will have limited complementary parking, but that will be reserved for speakers and VIPs. If you would like to park at Howard University Hospital and pay per hour, then that is also an option. Parking rates are about $2-$3 per hour (all day $14). Once you park your car at the hospital, you can walk to the entrance of the hospital. The Howard University Shuttle Bus also stops in front of the hospital. Once boarding, please provide a state issued ID and let the driver know that you would like to be dropped off at the Cramton Auditorium. From Cramton you will need to walk over to Blackburn nearby. 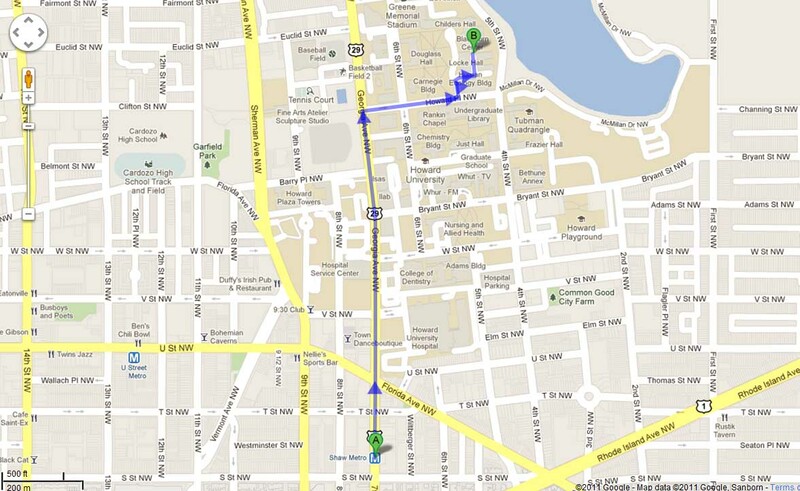 Below is a map from the Metro to the Blackburn Center. If you decide to walk, this walk is just under a mile. If you wait for the Howard University Shuttle Bus, the bus will travel most of this route. You will have to walk about 100 yards after the bus drops you off at the Cramton Auditorium.